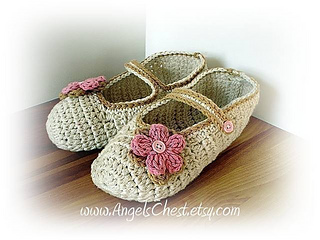 This listing is for a crochet MARY JANES slippers PATTERN. This is a PATTERN for an adorable pair of MaryJane slippers. They are not only cute but also perfect for a gift. It will not only keep your foots comfortably warm but I promise that you will received many compliments from your family and friends. They are very easy to make if you follow my step by step instructions. I offer full support with my patterns. ** This pattern is Copyright created and designed by AngelsChest. This pattern may not be distributed in any form. You are welcome to sell the finish product that you make using the pattern, the only thing I ask is that you put a link to my store mentioning the pattern. Thanks.